Over the next two decades, Temujin formed a group of faithful followers and arranged important alliances with various tribal chiefs, which helped him to succeed in his campaigns to reclaim first the Kiyat clan and then the Borjigin tribe. By 1189, he had united the Mongolian tribes. He then organized them to conquer his blood enemies, the Tatars, and then the Naiman (the powerful Turkic tribe to the west). In 1206, the Great Huraltai (Great Assembly of Mongolian tribesmen) proclaimed Temujin supreme ruler of the Unified Mongolian State, giving him the title of Genghis Khan, or Universal Ruler. * Genghis Khan then reorganized the Mongolian tribal structure into a military organization. He divided the entire population into military units of tens, hundreds, and thousands, with accompanying households and cattle to supply provisions for them. Genghis Khan's banners of peace (white horse-tails) and war (black horse-tails) displayed in the National Museum of Mongolian History. 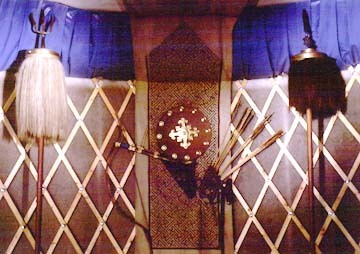 Between them is a recreation of a bow, arrows, and quiver from the time of Genghis Khan. After devoting 5 years (1204-1209) to the internal organization of the newly unified state, Genghis Khan began his expansive military campaigns against neighboring groups and then more distant empires. At the time of his death (1227), he had conquered the territory from China to the Caspian Sea. * "Genghis Khan also introduced drastic liberal reforms." Genghis Khan's son Ogodei succeeded him in 1229, and he and other descendants extended the empire until it stretched from the Black Sea to the Korean Peninsula, from the rest of the Russian princedoms to the Bulgar principalities, Central Asian territories, and all of East Asia. * His grandson Kubilai Khan established the Yuan Dynasty in China, moving the Mongolian capital from Harhorin (Karakorum) in Mongolia to Dadu (later called Beijing), where he ruled over Mongolia and China. The Yuan Dynasty lasted a little more than 100 years (1264-1368). Batu Khan, another grandson and warlord, led the Golden Horde (13-15th centuries) in the conquest of Hungary, Bulgaria, and Russia in the west and Central Asia. The Ilkhanates of the Middle East, originally ruled by Genghis Khan's sons, and India established rule over the highly civilized nations of Iran, Iraq, Mesopotamia, India, and Persia. The conquered populations endured many hardships from the Mongolian conquests, such as burned and destroyed cities, heavy taxation, and forced labor; once conquered, they had to pay tribute. But the Mongolian Empire brought about positive effects as well. The great expanse of the empire allowed trade and travel to flourish between different countries, encouraging continued trade along the famous Silk Road and forming additional trade routes throughout the vast Eurasian continent. The Mongolian Empire brought together western and eastern cultures, allowing them to intertwine. The Mongolian capital Harhorin, built during Ogedei's rule around 1235, had a metropolitan culture and served as a center of trade, multicultural exchange of arts and sciences, and as a religious haven. Genghis Khan as statesman, by Chimiddorj, 2001.